In the wake of a school shooting in his hometown of Raleigh, North Carolina, a Republican U.S. Senator running for re-election candidly questions his belief in God to a blogger, perhaps crushing his re-election hopes. There are no easy answers in this topical look at gun violence that is simultaneously funny, heartbreaking, and uplifting. Part of our Mini-Rep! 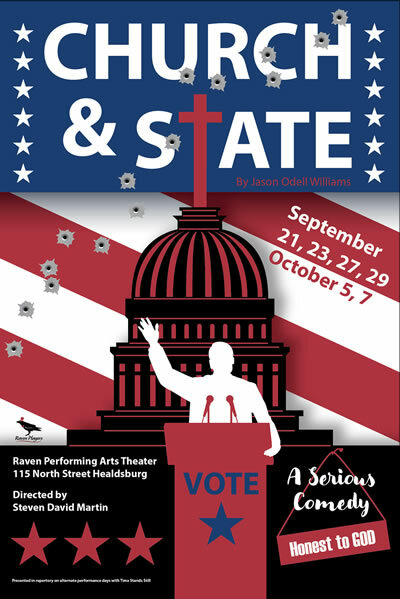 Two contemporary plays about complex issues we face in these tumultuous times. The plays will be presented in repertory on alternate performance days. Join us for opening night of any production and stay afterward for a celebratory toast to the cast and crew! Immediately following all Sunday matinees, members of the cast and crew will return to the stage to answer your questions. Tickets also available after 8/20/18 (cash/check only) at Copperfield's in Healdsburg & Santa Rosa.